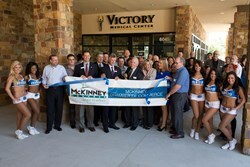 Victory Medical Center Craig Ranch is located in the Medical District within the McKinney community. Victory Healthcare celebrates the grand opening of the new Victory Medical Center Craig Ranch, located in the master-planned community in McKinney, TX. A ribbon cutting ceremony was held at 5:00 p.m. on August 22, 2013 and special guests included Mayor Brian Loughmiller, the Mayor of McKinney, TX, David Craig, the founder of Craig Ranch, and Jodi LaFreniere Ray, President of the McKinney Chamber of Commerce, as well as Victory Healthcare executives. “Victory Healthcare is excited to open our doors to the McKinney community and provide world-class care close to home at the new Victory Medical Center Craig Ranch,” said Victory Healthcare CEO, Robert N. Helms, Jr.
Acquired in partnership with Forge Realty Partners, Victory Medical Center Craig Ranch is located at the corner of Alma Road and Stars Avenue. The state-of-the-art 58,000 square foot hospital includes a four bed Intensive Care Unit, twenty private suites, five operating rooms and two special procedure rooms, as well as the 56,000 square-foot medical office building attached to the hospital. Two additional operating rooms and one special procedure room will be completed by January 2014. “The new Medical Center is a state-of-the-art facility and will combine leading edge technology with personalized care for a first-class experience for both our patients and our physicians,” said Ashley Anson, CEO of Victory Medical Center Craig Ranch. Victory Medical Center Craig Ranch will bring approximately 110 jobs to the community. The surgical hospital will provide specialty procedures including spinal, orthopedic and general surgery as well as gynecology, urology, bariatric, ear, nose and throat and pain management procedures. As in other Victory Healthcare facilities, patients at Victory Medical Center Craig Ranch will enjoy personalized care and attention, including a one-to-one nurse to patient ratio in one of the private patient suites, all of which offer Wi-Fi Internet connectivity, cable television and oversized floor plans to comfortably accommodate family and friends. Based in The Woodlands, Texas, privately owned Victory Healthcare is creating the standard in surgical care through its growing network of specialized surgical hospitals, training and education centers, and the only privately held tissue bank in the state of Texas. Our surgeons are the most highly trained and respected physicians in their fields, committed to providing revolutionary technology and minimally invasive treatment techniques. We create a first class experience for our patients in our state-of-the-art facilities that include concierge services, a one-to-one nurse to patient ratio, and personalized service in an environment designed to promote comfort and healing. Victory Healthcare partners with physicians to create an exceptional surgical experience for our patients, their families, and our surgeons. Learn more about the Victory Difference – a dedication to healing through education, technology and first-class care - at victory-healthcare.com or follow us on Twitter @VictoryCor. Victory Medical Center Craig Ranch is a private surgical hospital that provides leading-edge technology and superior personalized care from the region’s top physicians. Patients will experience the Victory Difference - a dedication to healing through education, technology and first-class care – at any one of Victory Healthcare’s surgical hospitals. At Victory Medical Center Craig Ranch, patients will receive first-class care including a dedicated nurse, private, spacious patient suites, and luxury amenities such as gourmet food Wi-Fi, high quality linens and convenient front door parking. Victory Healthcare operates in partnership with our physicians to create a new standard of surgical care. For more information, visit us at victory-healthcare.com/craigranch or follow us on Twitter @VMCCR.